Let's start backwards. We're taking for granted the fact that you, like most Americans, have a junk drawer or even a whole junk room that is embarrassingly overcrowded with ... well ... junk. We're also assuming that, in years past, you've resolved to finally organize all your stuff. But buying boxes and baskets, no matter how pretty and convenient they look, is really just adding more stuff (aka "junk") to the equation. 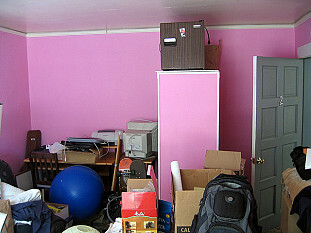 So why not take a different tack, by imagining the end result you really want -- an uncluttered, comfortable (former) junk room? Envision. Junk rooms do not usually begin life as dedicated dumpsters. They just somehow take on that role over time. Ask yourself this: What did you originally want the room to be? Is that still a goal? Envision your junk room remodeled into the role you'd like it to play -- craft room, extra bedroom, den, home office, or whatever you fancy. Fix that vision firmly in your mind, so you have a clear-cut objective to work toward. Don't organize your clutter, clear it out. This could be by selling, giving away, recycling, or trashing items you no longer need or like. But it may also include reclaiming from the clutter pile those things you really love. Just one example: taking that vintage travel poster to be framed so you can display it proudly on your wall is the upside of decluttering. Be realistic about selling your former junk. Craigslist and eBay are great places to exchange unwanted possessions for cash (which is almost always wanted) but be realistic about how much time you're willing to invest in the process of selling off your old comic collection, for instance. Make sure that you'll earn a reasonable sum for the hours you invest. Start with a success. How about your favorite shirt that you never wear anymore because one of the buttons is hanging by a thread? Sewing that button back on will instantly transform your top from potential trash to beloved treasure. Set a limit. Decide to work for a specific number of minutes or deal with a predetermined number of things. Start big; otherwise you'll wear yourself out sorting your stamp collection and end up discouraged because you didn't make any significant dent in the mess. I set a simple kitchen timer and resolve to stop when the buzzer sounds -- it's a great lesson in setting boundaries. Make yourself a sticker chart or other reward system (no, a piece or three of chocolate is not the best idea). Decluttering and organizing can seem like an endless task, so it's important to recognize small milestones along the journey. Once you've made good headway with clearing the room, assess its "bones": size and shape, amount of light, electrical outlets, and all its pluses and minuses. You might want to get a second opinion from an architect or designer about whether it will suit the purpose you envision and what you might need to do to make it work. Paint your former junk room a fresh white or a cozy neutral shade. This will give you the encouraging sense that you're starting with a clean slate. Then look over your possessions that you cleared out but set aside to save. Do you feel comfortable putting them back into your fresh new room? If so, they are keepers. But if not, you know what to do.